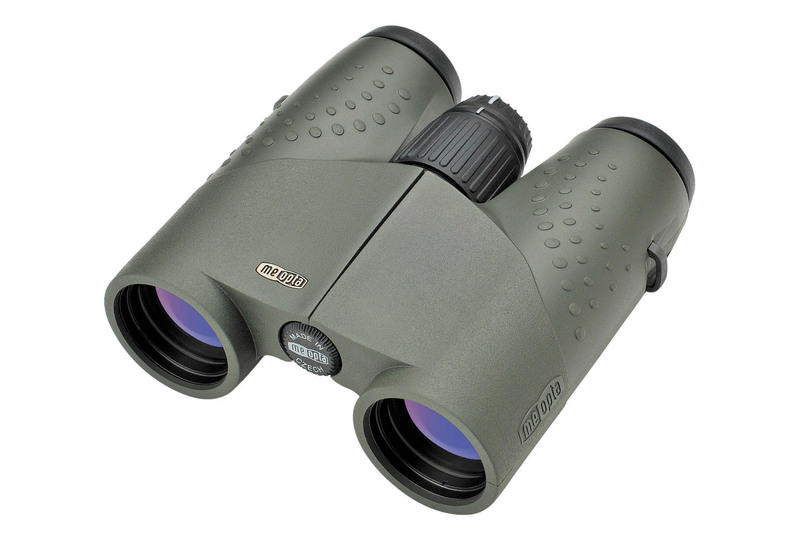 Part of a range of six, the MeoStar B1 8x32 is a small, lightweight, multipurpose binocular designed by Czech manufacturer Meopta to cover a wide range of outdoor activities. Having recently been impressed with the company's 82 mm S2 telescope, the B1 had a lot to live up to - and my expectations of its performance were already high. The short days and frequently poor light conditions of mid-winter arguably provided the harshest test conditions for this binocular as I put it through its paces during January in a variety of habitats from woodland to wetlands. Finished in green, the rubber-armoured body is constructed using aluminium alloys. It feels well built, nicely proportioned and is comfortable to hold and operate. Cutaway thumb-rests below the barrels and wide gauge stippling in the proximal part of the body combine well to increase grip. The generously deep focussing wheel turns smoothly but, at the same time, offers some resistance, which I believe was beginning to loosen up towards the end of the trial period. The wheel's position relative to the strap lugs just enables the user to keep the forefinger straight while focussing, which adds to the comfort factor. The wheel turns through approximately 1.7 clockwise revolutions between a spot-on 1.8-m close focus and infinity, while a narrow dioptre adjustment wheel is centrally positioned immediately in front of it and operates almost in the manner of a small-increment click-stop mechanism. Initially it struck me as uniquely odd but it works well and it is effective in as much as it is not easy to dislodge it from its setting accidentally. Ocular adjustment is a simple affair. Despite being – in my opinion – a little shallow, the rubber covering is comfortable against the eye, while the eyecups twist out to click-lock positively and firmly at two points beyond the fully retracted position. The full field of view – a very generous 138 m at 1000 m – is still visible in the fully extended position. Considering that this is not billed as a quality ED binocular, the image is surprisingly good. A Schmidt-Pechan prism system and a fully multicoated lens arrangement are no doubt key ingredients in helping to deliver a more than acceptable image. Despite the small objective size, it remains bright, even at twilight, when the binocular's overall light transmission drops from 88% to 84%. One needs to look hard to see any chromatic aberration as it's not immediately apparent, although there is some slight ‘sacrificial' distortion at the edges of the image, presumably as a result of the widening of the field of view. Contrast is excellent, and the B1 returns super-rich colour tones. It was a pleasure using it to watch Waxwings at close range as well as being able to ‘pull out' and identify Caspian Gulls among the throng of distant gulls on my local landfill. It comes with an articulated rainguard, tethered objective lens covers (which work loose far too easily), a comfortable padded neck-strap and a soft carry case. Although the warranty period is a standard 10 years, this can be boosted to 30 years by registering it with Meopta within 30 days of initial purchase. This binocular is one with which I felt instantly comfortable. With an SRP of £995 it is not inexpensive but it's still well below the pricing of some high-end competitor brands. This review was originally published in the March 2017 issue of Birdwatch magazine.